First of all, what does a locksmith do? Locks supplied in fitted – all types and brands deadlocks, window locks, garage lock etc. In a general sense some jobs associated with being a Locksmith are, cutting new keys or duplicate existing keys using key-cutting machines, impressions or code key machines. Locksmiths travel to you to install locks and closers in doors and disassemble electrical and mechanical locking devices. They also maintain locking systems by replacing and repairing worn out springs, tumblers and other parts related to locks. Locksmiths set up or maintain master key systems and keep records of company keys and locks and/or homes. 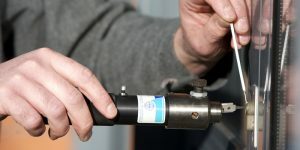 They may also solve problems by manipulating cylinders in order to open locks that have no keys and by opening safe locks by using drills and other tools. To become a locksmith, you will need to do an Apprenticeship or Traineeship. To name a few, check out Google for even more, type Locksmith Apprenticeship in the Search. Ability to work well and multi-task. These are all attributes that can be worked on before and while commencing your training. which will help you to implement them all once you are qualified. I hope this has helped in your pursuit of becoming a locksmith. If you are after a Great Locksmith service, then Contact Us!